In addition, the RAMBox cargo system equips drivers with special cargo bed dividers and extenders that can provide yet more room and secure space for cargo. Plus, drivers can easily lock and unlock their valuable merchandise with their keys or internal control buttons. 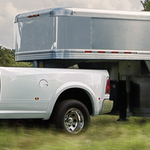 Ram 3500 drivers can also haul movable gear such as motorcycles and ATVs in safety and comfort with the included adjustable tiedown cleat system. This system incorporates structurally mounted cleats that are capable of securing heavy loads.